Developed for all soils, including compaction-prone, native soils, TriCure Micro offers new technology for preventing the development of hydrophobic soil conditions. Effectively treating soil requires penetration into the micro pore space to assure even water distribution. The unique formulation in TriCure Micro helps reach and treat even difficult soils for an effective water management program. When mixed with water, surfactant molecules form clusters due to their polar attraction. The size of these clusters can prohibit the effectiveness of the surfactant by making it difficult to move in compacted soil environments. Through TriCure Micro’s proprietary comminution process, clusters are broken down and reduced in size to micro- and nano-particles, enabling more effective penetration into soil micro pore space to better facilitate water movement. TriCure Micro is designed to penetrate and effectively treat compacted soils. Since they typically contain a high silt or clay content, these soils often have low infiltration rates and poor soil porosity. This makes it difficult to get most surfactants down into the soil and often requires extended irrigation cycles. TriCure Micro is designed with a smaller molecule which enables faster soil penetration and better soil treatment. When mixed with water, surfactant molecules form clusters due to their polar attraction. The size of these clusters can inhibit a product’s effectiveness by making it difficult to penetrate and move through soil profiles, particularly tight soils with high silt or clay. TriCure Micro’s proprietary comminution process breaks these clusters apart and reduces them in size to micro- and nano- particles, enabling better soil penetration and treatment. Like TriCure AD, Micro treats not only the sand/soil component of a root zone, but also the soil organic matter. This assures effectiveness in the widest variety of soil types and compositions and can prevent thatch and other organic matter from creating hydrophobic conditions. TriCure Micro can be used for all soil-water stress conditions, including the prevention of hydrophobic soil and treatment of existing hydrophobic conditions. TriCure Micro is designed to be the only product needed on a site, whether treating compacted fairways or sand-based greens or tees. Label rates of TriCure Micro are based on hard-to-treat soils. For most other soil types and applications, TriCure Micro can often be applied at reduced label rates. Micro doesn’t lose its strength at lower rates and has a very flexible range of use rates. 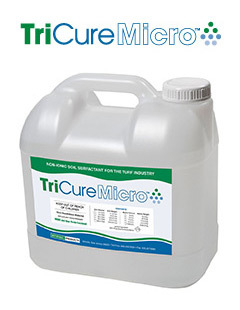 TriCure Micro is a 50% active concentration which provides low viscosity for easy tank mixing or injection into irrigation systems. TriCure Micro is non-phytotoxic and compatible with most commonly used turf chemicals.